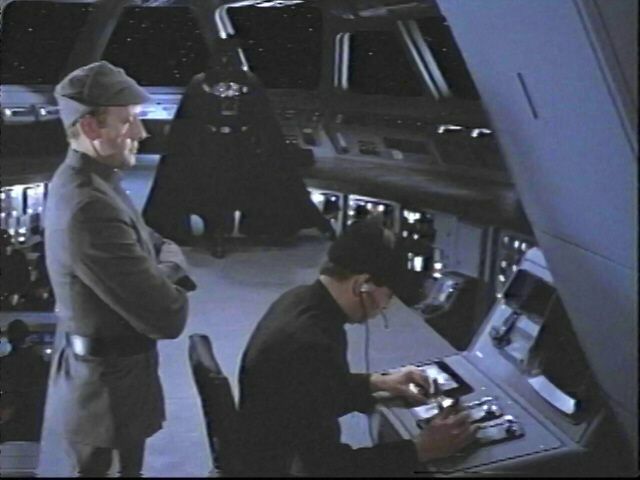 In the hey-day of the Star Wars Literary Guild, when we were busily writing our respective Star Wars stories, an interesting and at first surprising development took place: Admiral Piett, heretofore an interesting yet minor character, seemed to develop a life of his own. It was particularly Alex inspirational decision to allow a romantic subplot to develop that opened up huge possibilities of plot and character development. As I was working on my version of the prequel, trying to write my way through what was supposed to become a story of epic proportions, I had unfortunately no chance of really including him in the story - though he was supposed to make a brief cameo appearance. Somehow I started to ponder of what would have happened if he had survived the destruction of the Executor. What would have happened to him if he had managed to get into an escape pod? The place he most likely would have ended up was, of course, Endor. With the Imperial fleet defeated, the Death Star destroyed, and Darth Vader and the Emperor both dead, he would be stranded there and would have to deal with the Forest Moon's native population, the Ewoks. The title of this tale, "Admiral Piett and the Great Ewok Adventure", came to me before I really had made up a story or spend much time considering what Piett's adventures on Endor would be like. Piett's 'Ewok Adventure' turned out to have little in common with, say, the official Ewok films. The plot, however, developed rapidly and I found myself writing this story, rather then the prequel, if only because it was of a more manageable size. It still took three years (with a long period in the which I neglected to write at all) to finish it. 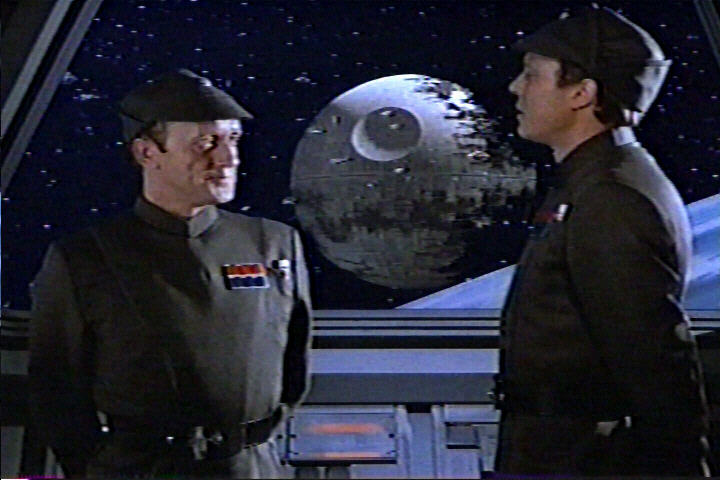 The background of this story is the one we invented by us and shares many of the background information about Piett and his companions with The Adventures of Darth Vader, but this is a parallel universe in which the events unfolded as they are seen in the film (though I still refuse to believe the veracity of the last moments of Darth Vader's life. This is just adding insult to injury. Jedi propaganda!). I have also decided to integrate the story-line of "The Truce at Bakura" (in my opinion one of the better official Star Wars novels). This gave me the advantage that all the main characters of the film were safely out of the picture. Otherwise, I have decided to ignore the official canon - not that there is much to learn about the background of these people in the novels published or to the unfortunate prequels. Please, what kind of a first name is 'Firmus'? Next to the plain fun of writing a 'what would happen if' story, in this tale I was able to address two points that were important to me. For one, that the Ewoks are not simply fuzzy, cutesy teddy bears, but are in the habit of eating their enemies. Secondly, and more importantly, that not all people in the Imperial Army were 'evil'. Many of them probably joined the armed forces before the Empire came into being. If we assume that the fall of the Old Republic and the emergence of the Empire happened around the time Anakin Skywalker turned into Darth Vader, and if we assume that Luke and Leia were conceived before their father's misfortune, the Empire would be about the same age as the hero and heroine of the Star Wars films, at the time of The Return of the Jedi it would be about 21 years old. A man of Admiral Piett's age, would have already started his career in the navy in the time of the Old Republic. But enough explanations: in the end it is simply story of Admiral Grigori Piett and his adventures on Endor and beyond. Chapter 1: In which Admiral Piett contemplates the difficulty of taking decisions in the shadow of the Lord of the Sith and comes to the conclusion that his sister had been right. Chapter 2: In which Mon Mothma watches the Battle of Endor and has some pangs of bad conscience. Chapter 3: In which Admiral Piett finds himself stranded on an strange planet and climbs a tree. Chapter 4: In which Admiral Piett encounters the indigenous species of the planet and meets another survivor of the battle. Chapter 5: In which Mon Mothma discusses the events on the Death Star with Princess Leia. Chapter 6: In which Admiral Piett encounters an old friend and learns more about the Battle of Endor. Chapter 7: In which Admiral Piett returns to their camp and heads out on another rescue mission. Chapter 8: In which Admiral Piett enjoys the cameraderie of a united force. Chapter 9: In which Mon Mothma is bored and wishes she could take a few days off. Chapter 10: In which Admiral Piett has to deal with an incompetent officer. Chapter 11: In which Mon Mothma realises that she, too, had started to believe their own propaganda. Chapter 12: In which Admiral Piett is caught in a landslide. Chapter 13: In which Mon Mothma and her companions reach the transmitter, and the ethics of war are discussed. Chapter 14: In which Admiral Piett and his companions visit another Ewok village. Chapter 15: In which Mon Mothma enjoys the hospitality of the Imperial shelter. Chapter 16: In which a camp fire is lit and a bottle of vodka is consumed. Chapter 17: In which the ship-wrecked are finally picked up. Chapter 18: In which Admrial Piett says his good-byes to his career, Captain Needa and Mon Mothma. Chapter 19: In which Mon Mothma discusses the benefits of fraternisation. Chapter 20: In which Admiral Piett returns home and drinks the really good vodka with his sister.